The chilling thought of North Korea's fully submersible submarines firing a nuclear ballistic missile isn't as far-fetched as some might think. Pyongyang has made major advances in weapons in recent years and shown a willingness to use its submarines for offensive military actions. Indeed, last month was the seventh anniversary of the sinking of South Korea's Cheonan navy ship by a North Korean submarine torpedo attack. That aggression killed 46 sailors and wasn't the first time the reclusive North had made incursions into South Korean waters. The submarine threat adds to growing fears in the region as North Korean leader Kim Jong Un's nuclear weapons ambitions show no signs of slowing. It also comes as a U.S. carrier strike force led by the USS Carl Vinson sailed toward the Korean Peninsula. Not surprisingly, North Korea decried the deployment of the American carrier task force to the volatile region. "If the U.S. dares opt for a military action … the DPRK is ready to react to any mode of war desired by the U.S.," the state-run Korean Central News Agency said Monday. DPRK is short for the North's formal name, Democratic People's Republic of Korea. 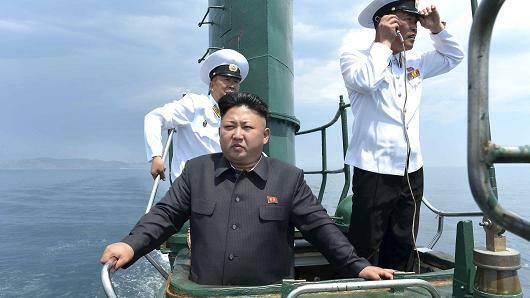 Experts believe North Korea's navy has around 70 submarines in its fleet, although only a handful today are believed to be capable of firing submarine-launched ballistic missiles or so-called SLBMs. What's more, defense analysts believe Pyongyang has the capability today of building a nuclear warhead small enough to arm a submarine missile. The submarine-launched missile flew about 310 miles toward Japan. The test set a new distance record for Pyongyang's SLBM program, and experts suggest the ballistic missile has the capability to travel more than 600 miles. "The problem with the SLBM is that it exposes South Korea's flanks to attack," said Bruce Klingner, an Asia and national security specialist at the Heritage Foundation, a Washington-based conservative think tank. Similarly, missiles fired by North Korean submarines off the east coast of Japan might be able to dodge detection from Japan's Patriot anti-missile system by launching from behind radar. Joint U.S.-South Korea military exercises this year included drills on destroying the North's submarines. Klingner said some people have been dismissive of the Pyongyang submarine threat by maintaining that the North's vessels are "old and noisy." The noise comes from the submarine's diesel-powered engines. Yet in 2015 South Korean defense officials reported a sudden disappearance of around 50 of the North's submarines. "We didn't know where they were at the time," said Klingner. "One would hope that we would keep very close tabs on those that could launch the SLBM." Advances in North Korea's land-based weapons development have been helped by its submarine program. "All of that is very worrisome because that may very well have a nuclear weapon someday," said Klingner. He said the North Korea's liquid propellant ballistic missiles, such as the so-called No-Dong medium-range, road-mobile system already is believed to be nuclear capable "so that means Japan and South Korea are under nuclear threat today." The secretive regime also is working to build an intercontinental ballistic missile that can reach North America. In January, NBC News reported that Pyongyang could test-fire the ICBM "at any time, at any place," quoting a senior regime official in North Korea. "Their conventional forces maybe not very capable at the moment, but they have a lot of weapons of mass destruction," said Nicholas Eberstadt, a researcher at the American Enterprise Institute, a conservative think tank based in Washington. "Even if they would end up losing a war, … they could kill an awful lot of people on our side."